Rabbit owners know that their quiet pets have unique personalities. When it comes to toys, rabbits can be as picky as wine tasters. Yet despite their different quirks, all bunnies have the same basic requirements. They need playtime, and they need a way to satisfy their chewing habits, and keep their teeth from growing too long. 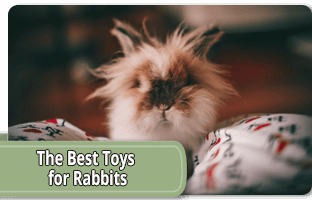 Here are the ten best chew toys for rabbits, based on which toys have the widest bunny appeal according to thousands of pet owners. 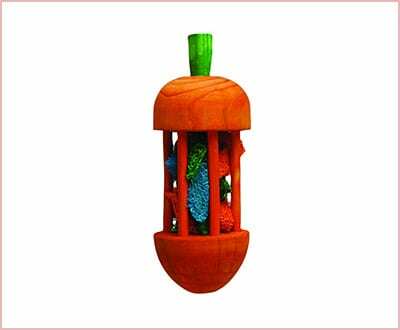 Although this chew toy is not targeted specifically at rabbits, it is perfect for all small animals that like to chew, rabbits included. 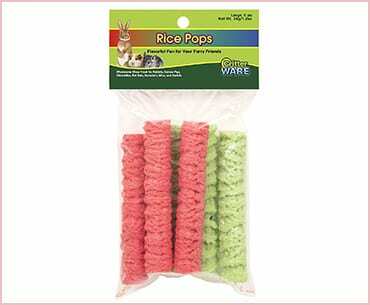 The package contains six small rice pops that are crunchy and crispy. They are also tasty, since they are made of corn and rice. 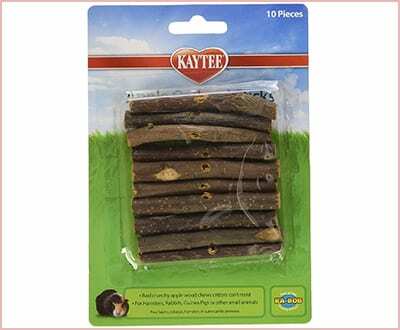 This pack contains ten short apple wood sticks that rabbits can chew on to dull their teeth and prevent boredom. A pack contains 10 sticks. Inside this carrot-shaped wooden carousel are several loofah pieces. When a rabbit chews the toy, the wood trims its teeth, and the loofah scraps floss and clean them. The carousel’s orange color comes from a food-grade dye. 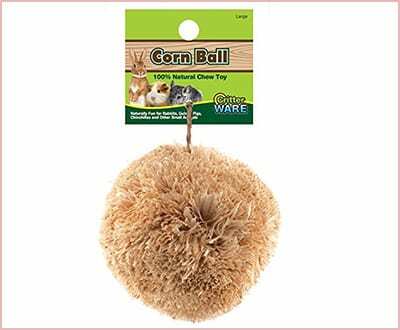 This large corn leaf ball is one of the safest chew toys for rabbits, because it is made of 100% natural corn material. At 4″ x 4″ x 4″, it fits comfortably in a human palm. The ball also has a loop of twine at the top to dangle from cage wires. 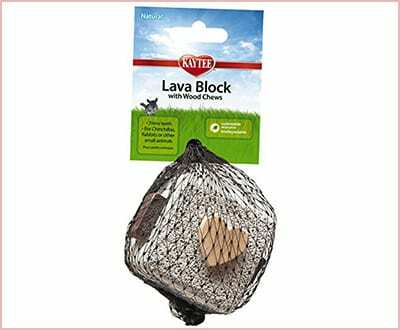 This unique block toy is made of volcanic rock embellished with natural wood shapes. If the wood pieces pop off, rabbits can chew them as individual toys. The block is about 2 1/4 inches square. 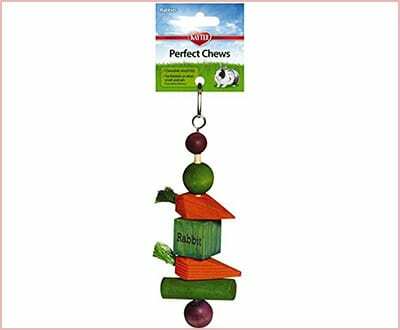 One of the best chew toys for rabbits is actually a kabob of seven toys arranged on an edible wooden stick. The toys, which are vividly colored orange, green, and purple, come in several shapes. They include wood and loofah textures. The kabob has a metal hook to fasten onto a cage. 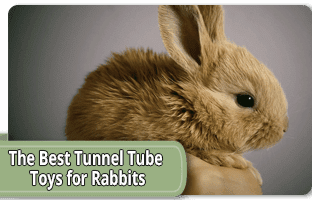 Rabbits will toss, roll, and push around this tube-shaped toy. Made of soft Yucca wood, it is 100% biodegradable. Tiny treats fit into the round hollows on the tube. This toy promotes rabbit exercise, and lasts a long time. 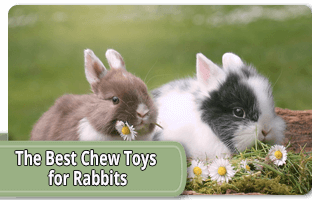 It’s one of the best chew toys for rabbits that have a furniture-gnawing problem. The three small balls in this collection are hand-woven of rattan, water hyacinth, and sea grass. Owners can pry the balls open and put snacks inside. Rabbits will stay occupied rolling these balls around and gnawing them apart. The Snak Shak is a chew toy that doubles as a small hideaway. It has the appearance of a hollow tree trunk, and is made with tasty alfalfa and honey. Buyers can purchase a small or large Shak, or a pack of two large ones. 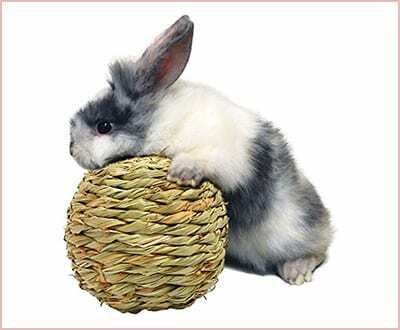 One of the best chew toys for rabbits is this simple, handmade ball. 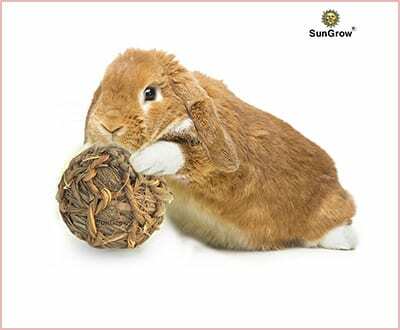 Many bunny chew toys include toxic plastics or inedible glues, but the SunGrow ball is tightly woven from organic sea grass and twine, using almost no adhesives. 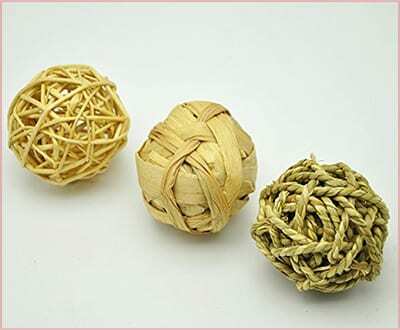 This large, woven ball is well-constructed, so it won’t disintegrate after a few days of play. 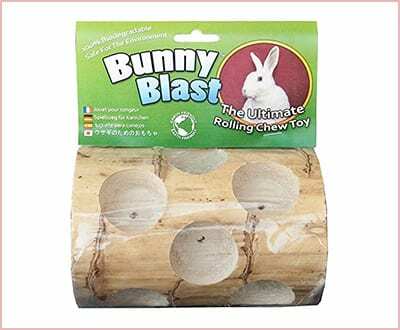 It is one of the best chew toys for rabbits because of its components: natural sea grass, which is safe for bunnies to chew on, and fiber that assists digestion. Multiple large rabbits can gnaw and paw at this ball together. From blocks to sticks to spheres, these are the very best chew toys for rabbits, based on stellar reviews from hundreds of bunnies (in the words of their owners, naturally). 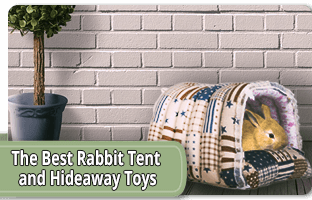 These toys will keep rabbits of all sizes engaged. Are you a bunny owner? What are your rabbit’s favorite toys?